Hey! Nielsen is a TV and movie site brought to you by the same folks that put together the traditional Nielsen ratings. They are running a trivia challenge (including OfficeTally questions!) and giving away a prize pack worth $1,000 — including a Sony PSP and Apple iPod nano! 9 out of 35 correct? I don’t think I’ve EVER done so badly on a quiz before. Ha! I’m glad you ended up making officetally, and not a blog about geek gadgets or eating at restaurants! Thanks for all your hard work tanster! (I’m one of those people who check your site 10 times a day!) 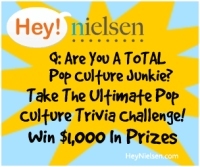 I did the trivia challenge and it turns out my pop culture knowledge doesn’t extend much past the Office! Darn it! i’m not old enough to to take the trivia challenge but i read the interview and it was really good! I also just got hooked on Arrested Development and have been watching the dvds. Wow, 40-50 hours a week! All your hard work is certainly GREATLY appreciated. :) Ever considered taking on assistants? Oh my gosh, Jennie! I knew you put a lot into this site, but 40-50 hours! You rock! This web site is awesome and you deserve every bit of recognition for it! Thank you for all of the time and patience you put into it for us Tallyheads! PS…I am one of those members who visits this site 10+ times a day. It is a favorite on every one of my computers. Thanks Tanster! I hardly knew any of those! I must have taken some good guesses, because I got 15 out of 35. It was pretty difficult. “Q: So, a spinoff of ‘The Office’? Any new gossip (or facts about this)? A: I have asked around, and nobody seems to know anything. If it does happen, I can tell you that OfficeTally will probably NOT cover it. I don’t get enough sleep as it is!” I think that’s very smart of you, Jennie. You already do so much for us fans — thank you! Great interview, Jennie! I’m always amazed when you talk about how much time and energy goes into OfficeTally. I know I’ve said it before, but it can’t be said enough – THANK YOU. As for the trivia challenge – I don’t watch a ton of TV, so the only questions I knew were the Office one and the Lost one. LOL Oh well! Seriously, the time you put into this site is criminal! Go to sleep right now!!! Honestly though, the fact that so many people come to you first for Office gossip truly says something. You truly blow my mind grapes, Tanster!!! Thanks so much for your dedication to the best site ever! And I too have this site bookmarked and visit at least ten times a day! LOL. I love It’s Always Sunny in Philadelphia, too. It’s just so wrong. A day without OfficeTally is like a day without a nice big cup of coffee. It wakes me up. It makes me happy. Thanks so much for all your hard work, Jennie. This site is definitely visited at least 10 times a day for me as well. I just read your interview with Hey! Nielsen and I seriously think you have THE best second-job ever! I know it may not always seem like that, but I know it must be really rewarding for you to be so involved with your favorite show. I envy you, and if you ever need help let me know! ;-) Everytime I go on the internet I have to go to your site. Even if I was just there 5 minutes ago. It’s like an OCD thing lol. I can’t get enough of your site so keep up all the hard work! Everyone here appreciates it! Oh, and I as well was a HUGE fan of Mulder and Scully. I still am actually, and when I saw the trailer for the new movie coming out this summer I was so excited!! It’s about time! Wait a minute…you moderate comments while you’re DRIVING?? Missy, you best be careful doing that!! I need you alive and well so I can get my OfficeTally fix every day! 20 out of 35? Man, I blew that one. That is a great interview, Tanster! You crack me up! Thank you for all of the hard work you put into this site! I can’t even put into words how much I appreciate it! I think I would die without OT! Wow, so cool to learn more about the mysterious webmaster. ;) Thanks for keeping this site up Tanster, it makes my favorite *that* much more awesome. Tanster – great interview! I love that you love It’s Always Sunny in Philadelphia – that’s also one of my fave shows. tanster, I can never get over how much work you put into this site. I’m so glad that you at least get the perks of set visits and keeping in touch with the cast- it makes me feel less guilty for taking away your Thursday nights!